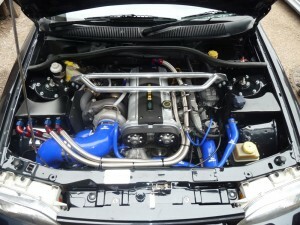 These engines are not suitable for road use and are a limited use motorsport unit only. Comprising of the same dry sumped bottom end as used in the 800bhp engine, but with the compression ratio optimised for use exclusively with race fuel. A smith and Jones large port cylinder head is used with even larger valves and even longer duration solid lifter camshafts. We have developed a large capacity equal flow inlet manifold, designed and fabricated by us specifically for this power level, coupled with a specially designed inconel split pulse large bore exhaust manifold. Fitted with a specially built (has a unique billet compressor wheel to reduce surge) Garrett GTX42r, a 9,500rpm limit and up to 3.2bar of boost, in excess of 1000bhp can be generated!